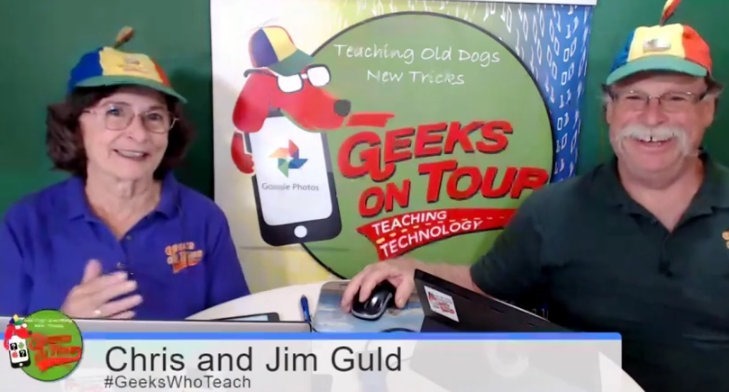 Lately we’ve had a lot of requests from Computer Clubs and Senior Centers to use our Geeks on Tour materials – videos, show notes, articles, handouts – for learning during their meetings. For years we’ve encouraged computer clubs to use our videos during their club meetings and classes. That way, the club leader doesn’t have to do the work of developing a formal presentation, just show our videos and then elaborate on the topic and facilitate Q&A. The members get to know Geeks on Tour, where they can continue to learn whenever they want. Now, with our weekly show, we think you have an even better opportunity for presenting valuable topics to your technology club and other group. Watch the video to learn together, pause it often in order to practice, play, and discuss the topic. Print out the Show Notes and follow along. I want to tell you how much I enjoy your show. Not only have I learned new things about technology but I’m learning how to better teach my classes to seniors. Review Questions: a list of questions about the topic covered in the Beginner’s lesson. We answer them during the show. Each show has written “Show Notes” that include timeline links. This allows you to know exactly when the Beginner’s Lesson starts and you can click the link to go straight there, or the Quick Tip, or the App, or the Review Questions. Use whatever portion of the show that best fits your group. We currently have 108 episodes for you to choose from! You can see them all listed at GeeksOnTour.com then click the menu item for Weekly Show. Maybe your group is requesting topics that aren’t part of our weekly shows. We have 460+ prepared videos on topics ranging from Facebook to Windows basics, to Google Maps, Photos, and Movie Maker. We also have several hundred articles on GeeksOnTour.com as well as PicasaGeeks.com and more. If you think we may have helpful materials for what your group wants to learned, but can’t find your needle in our haystack, we can help. Just post your needs on our Forum and we’ll post back with a suggested “lesson plan” of materials. There is no charge for using our materials in a group. All we ask is that at least one person be a premium member of Geeks on Tour – that’s how you get access to the materials. As long as the materials are used in the club setting, there is no extra charge. Just make sure the audience is aware of the option to become a Geeks on Tour member themselves. We can even give you a club discount coupon code if you’d like. If you need help finding the appropriate materials for the subject you want to present, please post in our Q&A Forum under General Learning Questions. Tell us the topic you want to present and we’ll give you a list of materials. Published by MrsGeek, in Blog. Tagged with Computer Clubs, Teaching Technology, Technology Clubs.